The other night, Bill Evans, the police commissioner, was at a community meeting the mayor was holding in Mattapan and, after a while, Evans looked at his watch and decided to slip out because he had some other things to do. But it was nothing like he expected. “Can I shake your hand?” the woman asked. Last summer, her 21-year-old son had what could have easily turned into a lethal confrontation with Boston police in Dorchester. A police report on the incident alleged that gang unit officers responded to the sound of gunshots and found her son pointing a gun at them. The cops had every right to shoot him. But they didn’t. The woman told a slightly stunned Evans that her son was doing well and that she appreciated that the police didn’t kill him. Just hours before that community meeting in Mattapan, cops responded to a 911 call at an apartment building in East Boston and found a guy standing in the hallway holding a large kitchen knife. The guy took three steps toward the cops, then three steps back, almost dancing to the tune of suicide by cop. One of the cops took cover in an open elevator and kept the door open, while the second cop backed down the hallway, holstered his gun, and tried to calm the guy down. The guy then charged toward the cop who had backed down the hallway, and when he came past the elevator the other cop sprayed him in the face with pepper spray. The cops then persuaded the guy to drop the knife and, after a brief struggle, got him to a hospital for psychiatric treatment. A month before, on Veterans Day, Boston police Captain Haseeb Hosein and officer Dave Godin found a man holding a hatchet to his neck, threatening to kill himself, on a bus in Uphams Corner. When the guy mentioned he was a veteran, Godin said, simply, “Thank you for your service.” The guy dropped the hatchet and Hosein and Godin escorted him to an ambulance. Anecdotes or a pattern? Bill Evans says it’s the latter, an ethos of deescalation that has been at the core of the department’s training and tactics for the last five years. It’s an existential question being played out on urban streets across America. Are cops guardians or warriors? Nobody who wears the BPD badge, from Evans right down to the gang unit cops who mix it up every day with kids who carry guns like you and I carry cellphones, is under any illusions. What happened in Chicago, what happened in Baltimore, in New York, in Ferguson, Seattle, San Francisco, you name the city, could happen here. In fact, Boston cops are wary of taking any bows, as if it might jinx things. But Evans insists it’s less likely to happen here because of the way Boston cops are trained and the way they carry themselves on the street, emphasizing restraint. On the day last month that terrorists killed more than 100 people in Paris, Evans was on his way home from Scotland, where he and a group of leading American police commanders from the Police Executive Research Forum spent a few days observing how unarmed Scottish police deescalate potentially violent confrontations. The biggest difference, of course, is that Scottish cops rarely if ever encounter people with guns, whereas for Boston and other city cops it’s a daily occurrence. But Evans said what he saw in Scotland reassured him that Boston was on the right path. In the five years that the BPD has emphasized such tactics, complaints against officers for excessive force have dropped 62 percent. 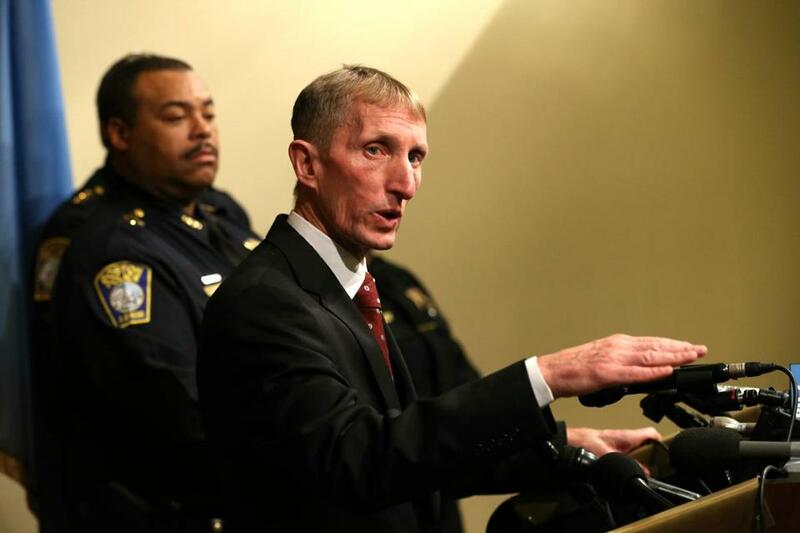 Boston police this year have shot three people, two of them fatally. Both of the fatal shootings were captured by surveillance cameras, including that of Angelo West, a career criminal who was shot dead last March after he shot gang unit officer John Moynihan in the face, seriously wounding him. That video, and one of a Boston officer and FBI agent shooting a suspected terrorist who menaced them with a knife, showed that the shootings were justified and went a long way in defusing the sort of thing we’ve seen play out on other streets, most recently in Chicago. So has the BPD’s outreach to various groups and leaders in neighborhoods where the use of force is most common. “I dread a shooting that’s not on video,” Evans said, because filling that void can be a combustible mix of rumor and grievance. As night falls, the plainclothes cops of the gang unit gather at their office at the foot of Meetinghouse Hill before heading out. Gerard Bailey, the deputy superintendent who heads the unit, and Sergeant Detective Jay Broderick compare notes. Of the more than 700 guns taken off the streets of Boston this year, the gang unit has grabbed about 100 of them. It is hard to find a gang unit cop who hasn’t had to make a split-second decision, to shoot or not to shoot.